I have to admit that I waste food every week thus, wasting my hardworking money. I tend to buy a lot of fruits and vegetable and they don’t last. Why? because I tend to buy organic, sorry I can’t eat crap and also fail to organize and prepare my food to keep longer. You can’t just place your foods in the fridge and expect them to last for when you need them, it just doesn’t work like that. What I find that works best for me is to prep my food. This helps me from not spending my money on fast food when food is already prepared for me. I notice that when I cut and juice my fruits and veggies I grab and go which is much easier, thus helping me to live a healthier lifestyle. I have to prepare a list of the ways that can help you to minimize food wastage and save money. Who knows you might need that for a rainy day. 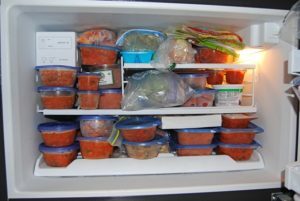 I am sure many of you know that freezing food does preserve it. Some things are ok to freeze while some your is better off not. What freezing does is to, limit microbes from growing. In other words, it helps to prevent the growth of microorganisms that cause food to spoil and that also cause foodborne illnesses. When frozen to 0°F microbes become completely inactive. In other words, it helps to prevent the growth of microorganisms that cause food to spoil and that also cause foodborne illnesses. When frozen to 0°F microbes become completely inactive. Fruits: Also all fruits can be frozen and still be delicious after the thaw. Fruits can freeze and be good for up to one year. They are great when used to make a smoothie, they give the perfect texture. Try washing them and place them in zip-lock bags. Try washing, cutting and placing them in zip-lock bags. Bananas are best peeled before being frozen, this avoids difficulty peeling after they become frozen and allow easy handling and preparation for your meals. Wash berries in vinegar water before storing them in the fridge. Dairy: Dairy of any kind can be frozen, this includes milk, yogurt, cheese and even eggs. 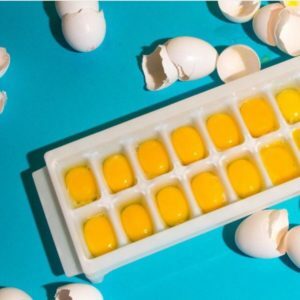 Yes, eggs can be frozen. Do not freeze them in the shell. What is suggest is to use an old ice cube container to store them. Herbs: No need to throw away those herbs and let your time and money go to waste. What preserves them is putting them in ice cube tray or functional container with a small amount of water or olive oil. Once frozen store them in a zip lock bag. Flour: Storing flour in the freezer helps to kill bugs/insect that may live inside it. Meats, (The most obvious), baked goods, Pasta, Grains, liquids and full meals. 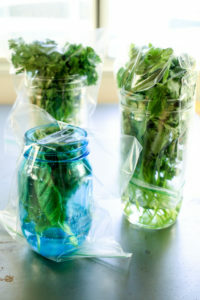 You can also store herbs in containers as well, just add water to the container. 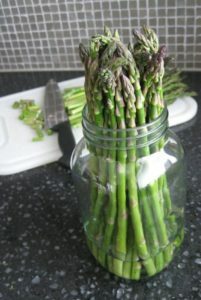 However, items like scallion stores well in a jar with room temperature water and asparagus stores well in cold water. Swiss, Collards and Kale are best in a glass of water and store in the fridge with a loose bag over the top. Not everything needs to go into the fridge. 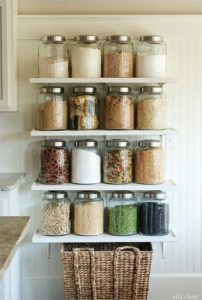 Containers are a great way to store dry items like rice and flour. Makes no sense buying what you don’t need and wasting your money. Produce goes faster than dry, processed foods. Hence, when shopping, do a meal plan and buy the exact amount of food you will need. Cleaning and organizing your fridge will help with proper storage and minimize spoilage not only that, but your food will taste way better. Storing cheese with garlic is very bad idea. That is why Storing your food in the right compartment of the fridge is important. Don’t assume manufacturers just made up storage compartments out of nowhere. They are made specifically for different food groups and items. Keep vegetables at the bottom of the fridge where the temperature is cooler. Leafy produce can last longer when you wash, dry and wrap them loosely in paper towels and place them in a perforated plastic bag. Storing fruits and vegetables together may cause spoilage quicker. Some fruits (apples, cantaloupe, honeydew and apricots) releases a gas called ethylene and vegetables are very vulnerable to it. With every effort buy local produce and support your local farmers. Not only are they fresher in most cases and last way longer, they are more natural and organic in most cases. Unlike not grown local foods that travelled along way to get to the supermarkets and have been sprayed with all sorts of chemicals. Use of excess food to make sauces, salads, side dishes or juices. 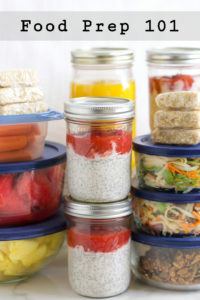 You can also food prep your meals to avoid eating out and use up the excess in the refrigerator.